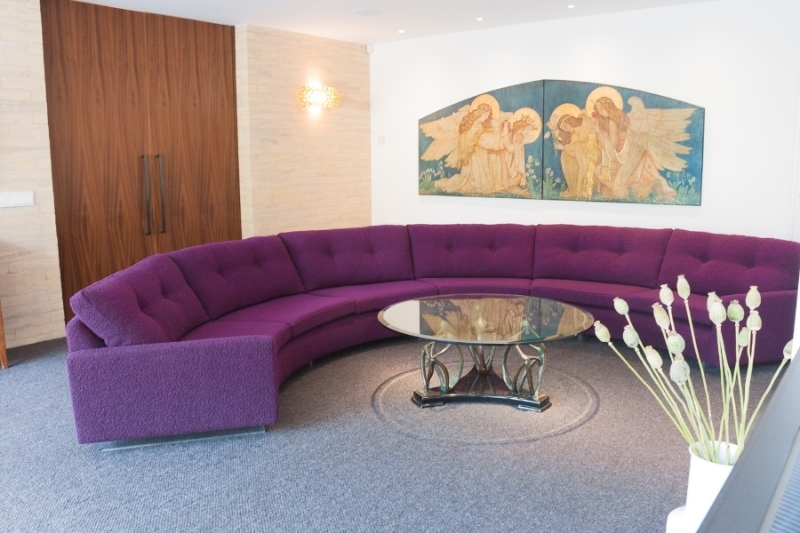 A recent project commissioned by Bridget Reading Interior design. 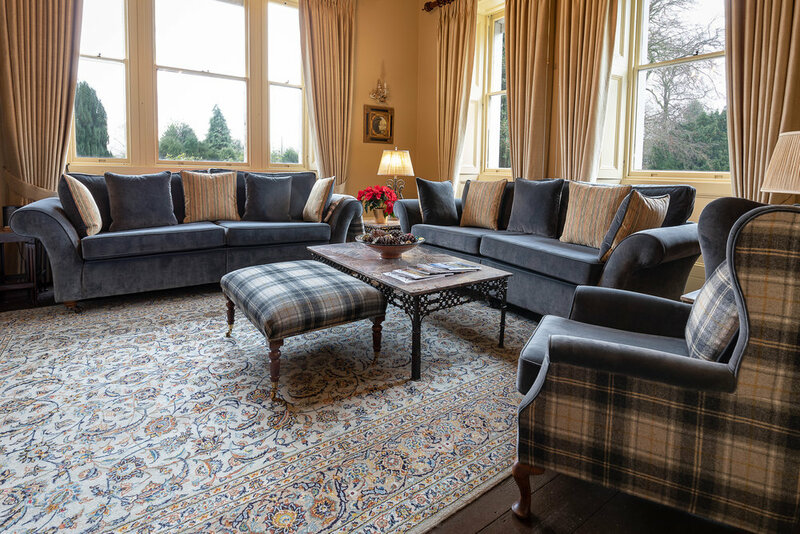 Here's a recent commission by beautiful Cleatham Hall for re-upholstery of sofas, armchairs, footstools and new scatter cushions. 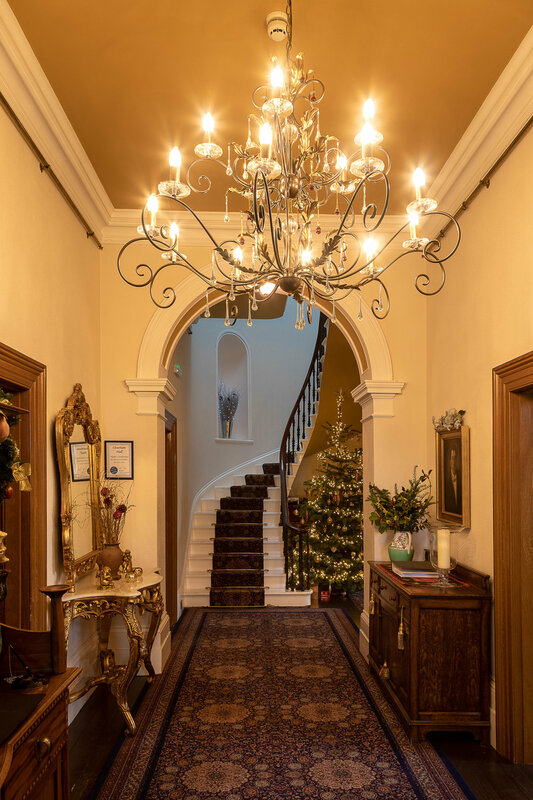 It's a truly stunning Grade II listed boutique hotel and exclusive use venue for weddings and private events in North Lincolnshire. Stunning Italian swivel chairs and footstool reupholstered in a natural sheepskin hide commissioned by Designer Daniella Draper. Handmade Dining chairs with walnut legs upholstered in a Christina Marrone Pumpkin with a beautiful wrapped back to compliment. Pair of retro Lurashell swivel chairs completely restored and upholstered in a herringbone wool. Scatter cushions made with a variety of patterns and textures will give you the option to have a new look each day. This beautiful suite has now be completely renovated with new seat springs and padding feather seat and back cushions. 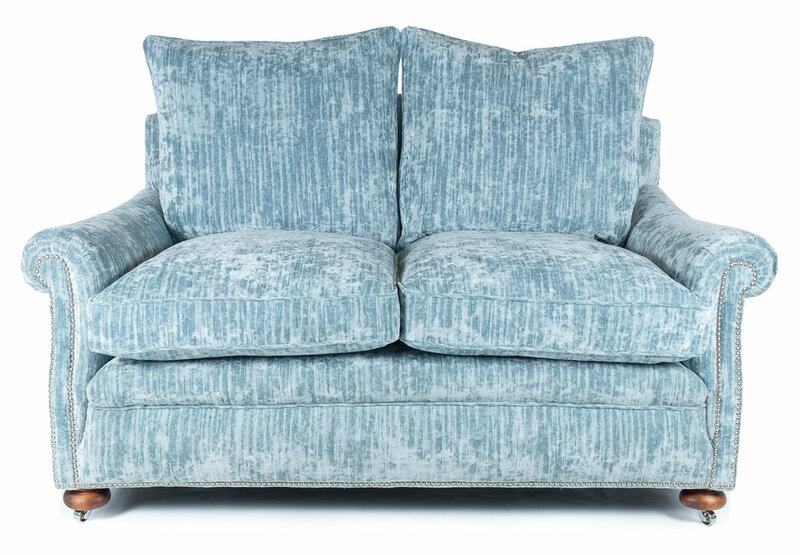 Upholstered in a luxurious textured velvet with decorative pewter studs around the facings,seat fronts and backs. 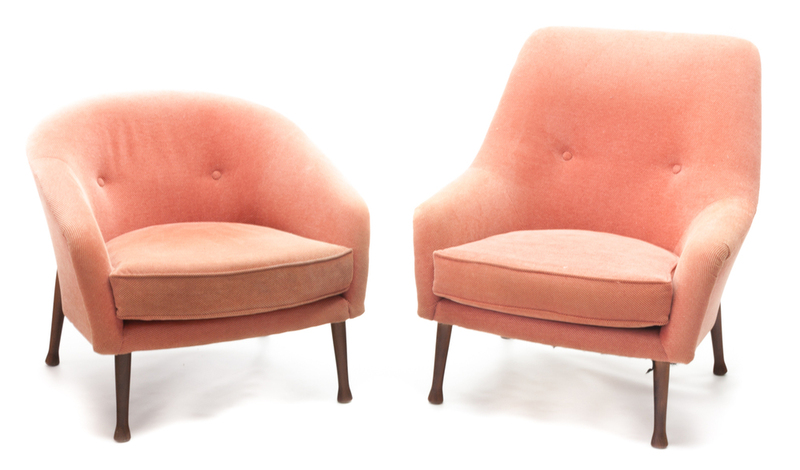 Retro winged banana rocker reupholstered in striking Linwood Velvet with pink contrast piping & buttons. 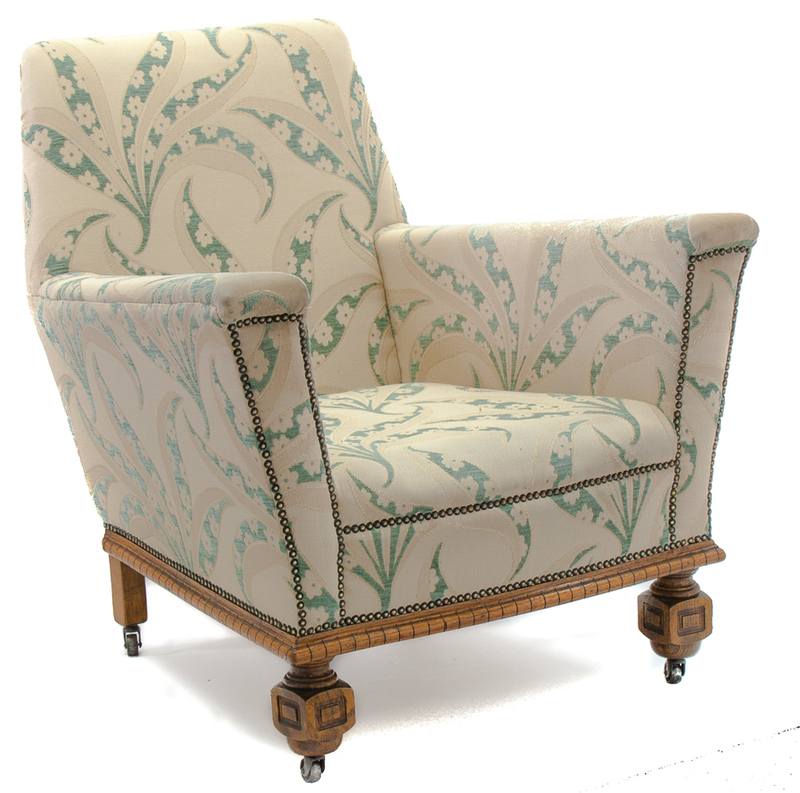 "We undertake all kinds of work from a single chair to a complete interior"
Two seater sofa reupholstered in Manuel Canovas col. Absinthe. Sofa reupholstered in Modena crush velvet. Reupholstered B & B Italia sofa upholstered in a Modena Luxury grey velvet crush. 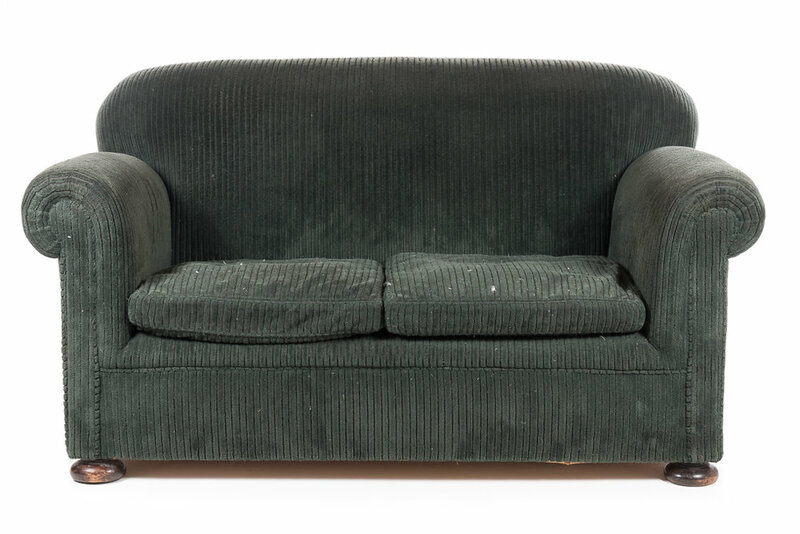 HOWARD KEITH DIPLOMAT SOFA FULLY RESTORED KEEPING ALL ITS ORIGINAL CHARM UPHOLSTERED IN A TEAL CRUSHED VELVET. 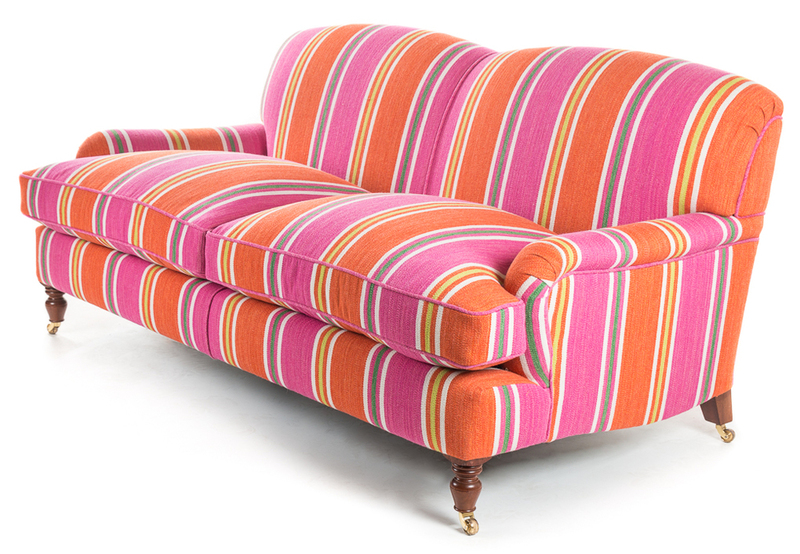 Lovingly restored sofa upholstered in a Manuel canovas Candy stripe simply stunning. 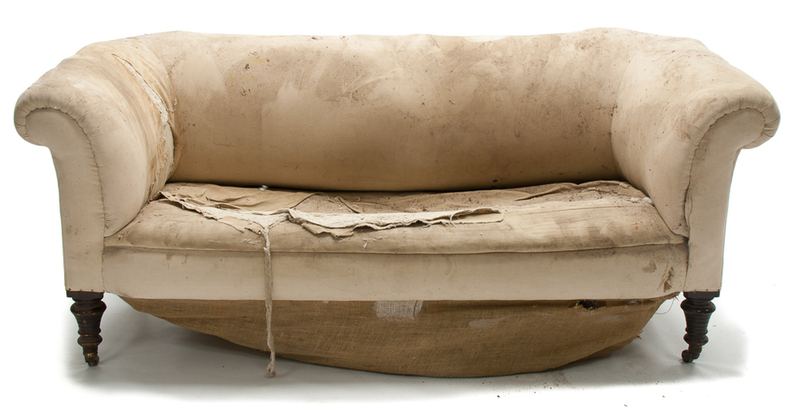 The above image shows two sofa's re-upholstered in Warwick Key Largo Pumice and another sofa re-upholstered in the Key Largo Mocha with matching footstools and scatter cushions. To finish this room off our clients chose Swaffer Parterre Colour 7 for the curtains which were finished with chrome eyelets on a polished chrome pole with a plain ball end. The picture above shows a recently commissioned bespoke coffee table made from solid oak. 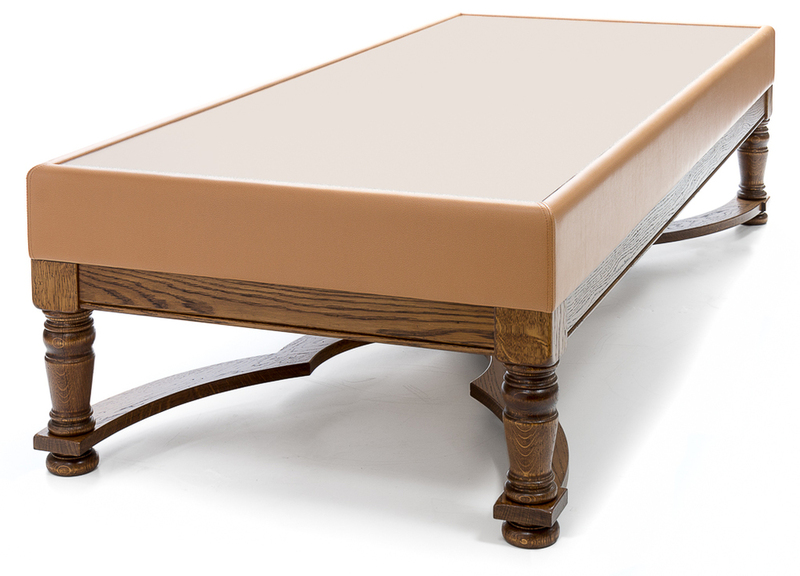 The top is upholstered in Ultra Leather Promessa 363-3142 Camel. 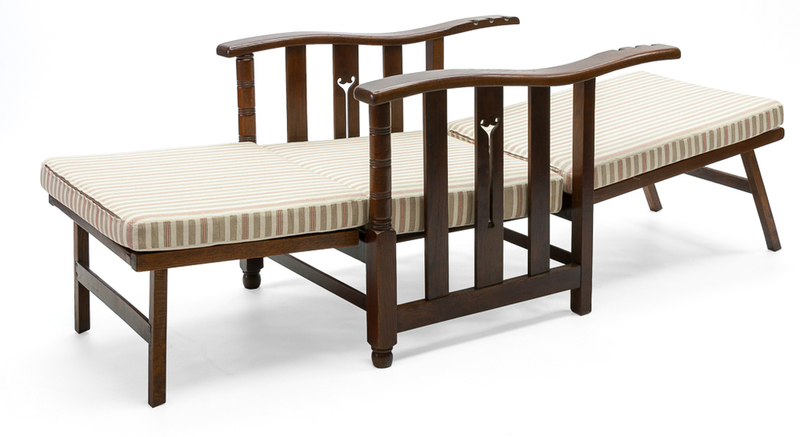 Complete with turned legs, and a show wood rail and decorative stretcher to match in with our clients existing dining chairs. 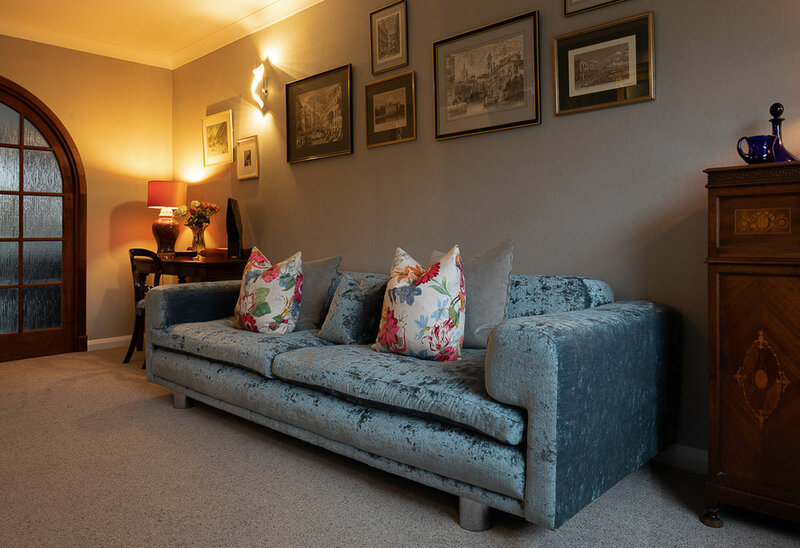 Below is a picture of the completed room with the large sofa, chairs and footstool re-upholstered in Chatsworth Fabrics Sorrento Bronze and Sorrento Cream. 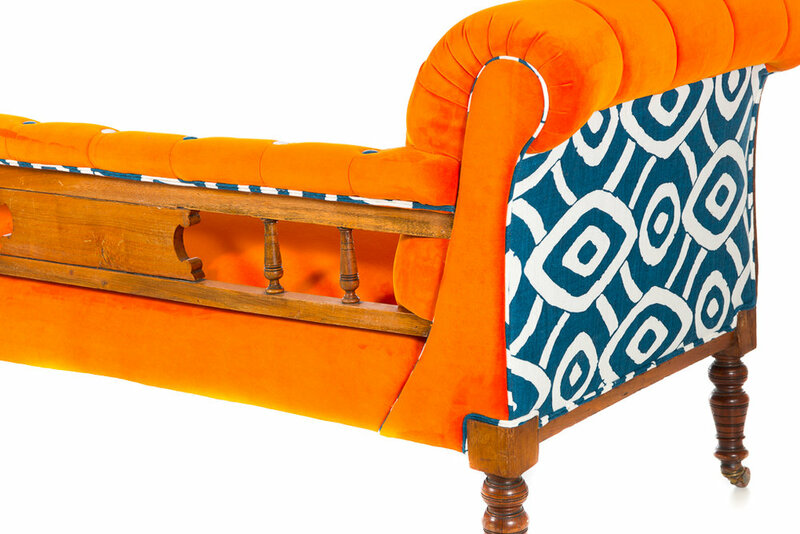 Beautifully designed ParkerKnoll Beverley Sofa Bed reupholstered in Liberty Chapman Tapestry Marmalade. 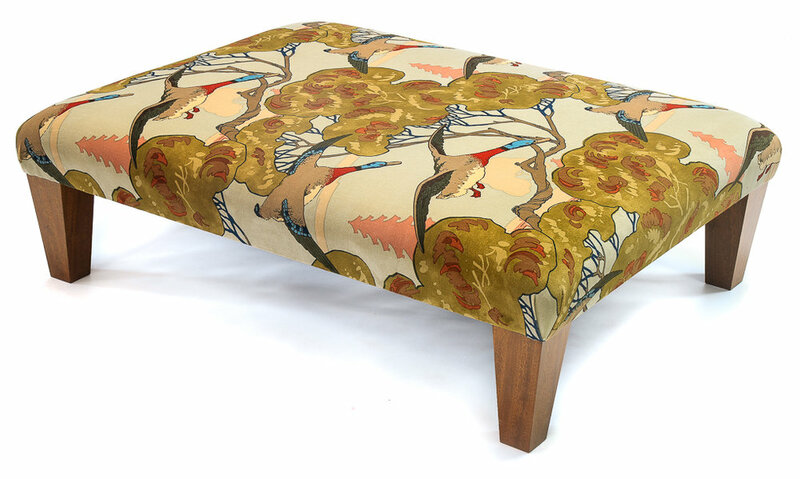 Below is a sofa which has been reupholstered in this fabulous Liberty London Shand colour Autumn. 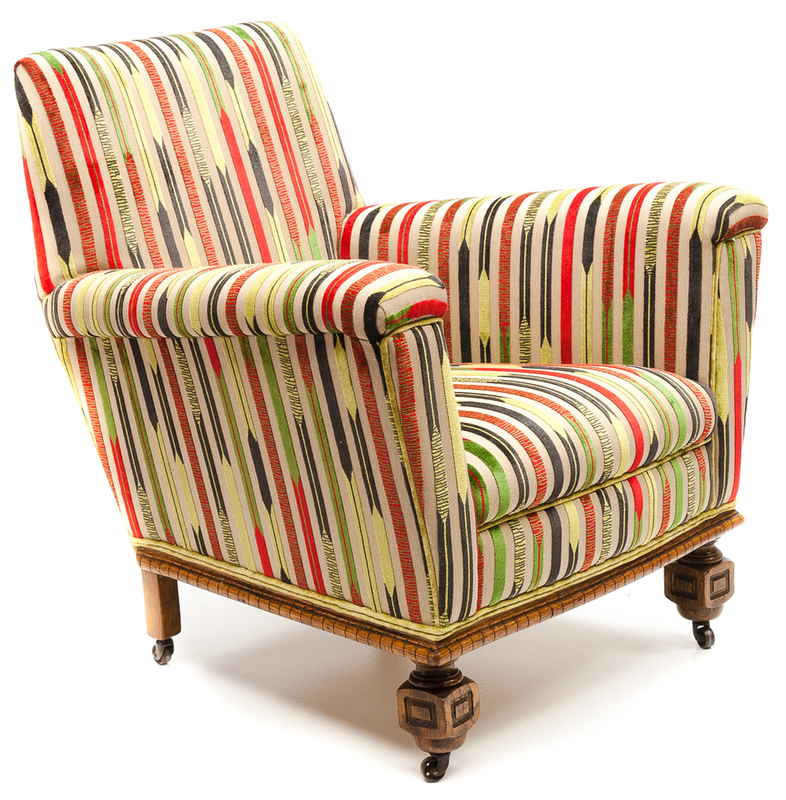 Restored Georgian Wing Chair for The Old Palace, Lincoln and upholstered in Villa Nova Striato. 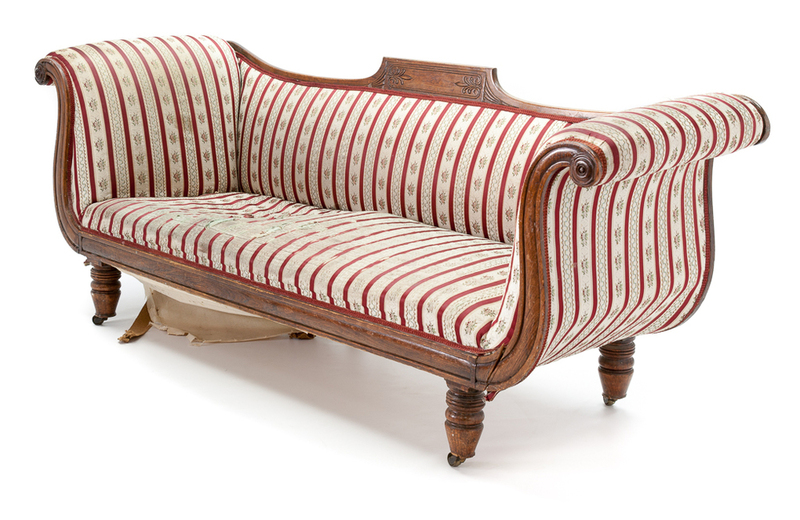 This stunning new sofa has been custom made for renowned interior designer Sophie Peckett. Covered in Ombre mIst with deep buttoned back and arms with detailed studding on the arm tops and seat front. 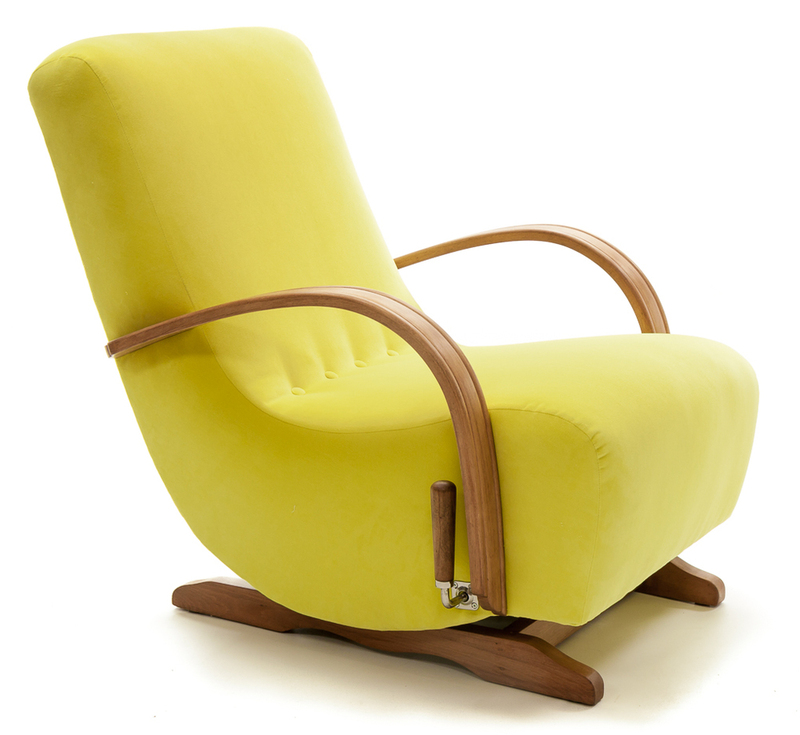 Swivel chairs reupholstered for Bridget Reading Interior Design. 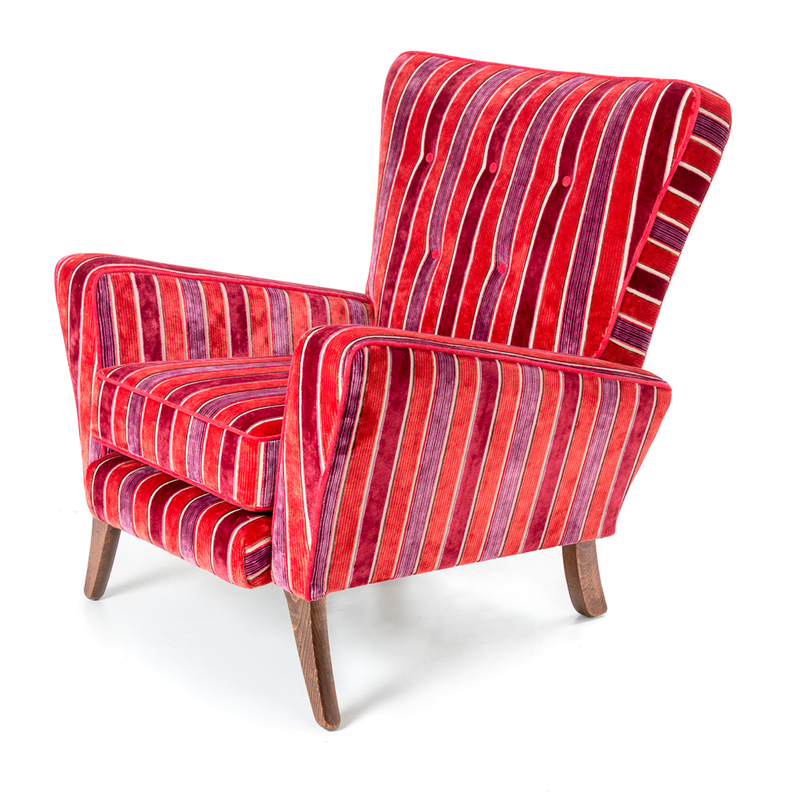 Renovated deep buttoned back chair upholstered in Warwick Crane Umber with contrast piping in JBrown Dakota 20 Claret. 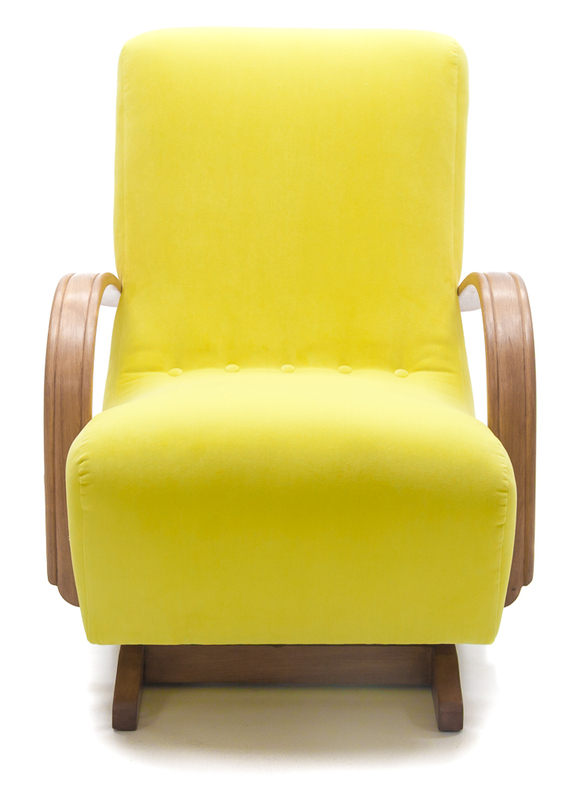 Completely renovated American Rocker covered in Warwick Tennyson Lagoon with a matching turquoise braid. 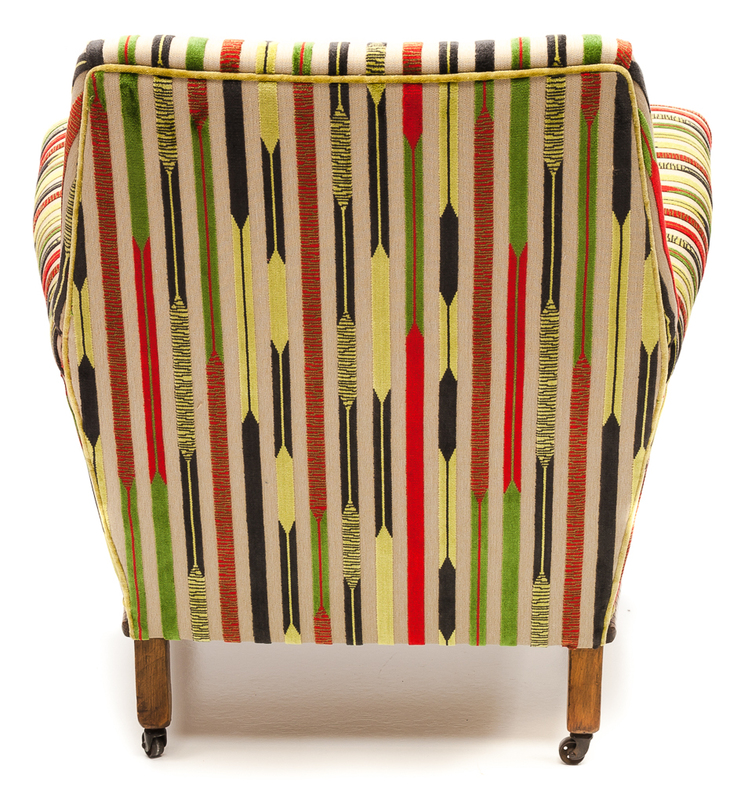 The small geometric shapes within this fabric really compliment this piece of furniture. Such a transformation! 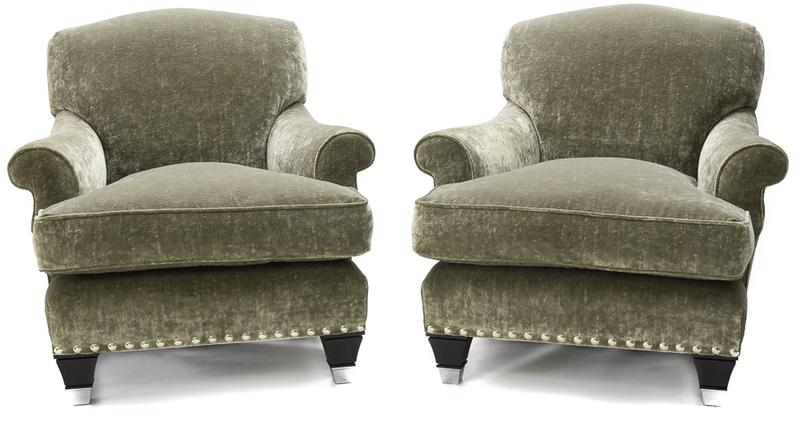 These Beaumont & Fletcher Wexford Armchairs have been restyled with new modern legs and upholstered in Zoffany Curzon Sable. Check us out! 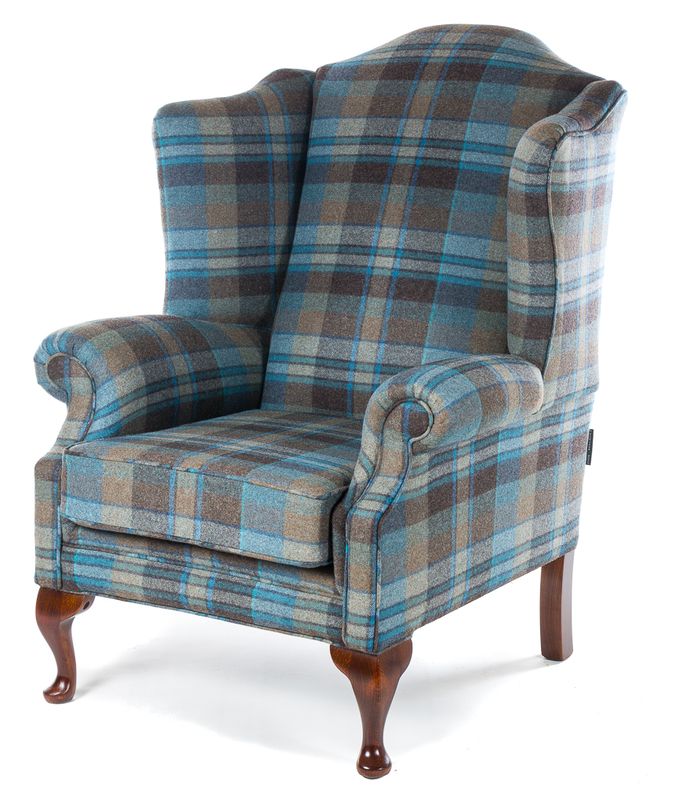 Below are a few examples of furniture that has been upholstered in 100% wool checks. We spend a great amount of time pattern matching to ensure the overall finish looks perfect, the attention to detail is everything. This is a before & after of a traditional deep buttoned Chesterfield sofa, upholstered in Romo Fabrics Orion Byzantium. The image above is a beautifully restored drop arm sofa in a William Morris Tapestry with the chair in a coordinated Morris Velour. 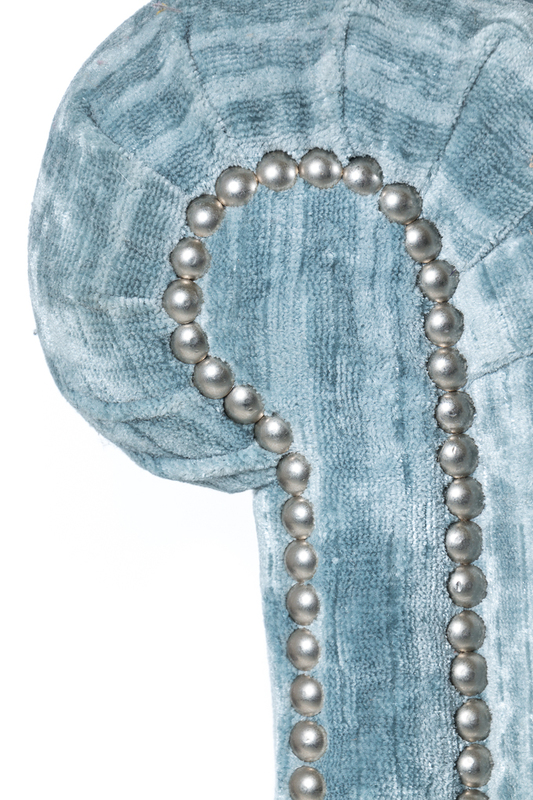 It just shows you don't have to keep to the same fabrics mix and match using similar tones can look very striking. Private clients can commission bespoke pieces of furniture including sofas, armchairs, dining chairs, headboards and footstools, have treasured pieces re-upholstered or select a unique design from The Crowther Collection.Before you decide to throw out an old sofa, chair, stool or any form of upholstered furniture, take a look at the transformation of the pieces below. 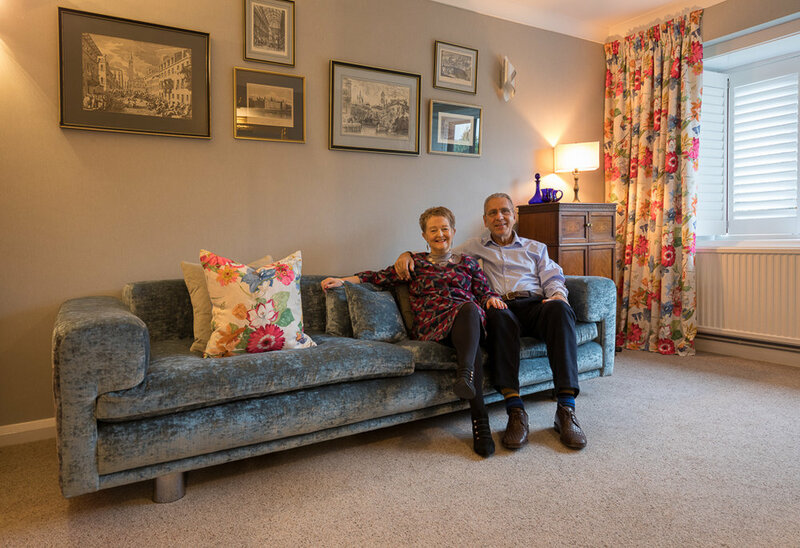 as no matter how old, damaged or worn it may be, Crowther & Sons can completely transform it into a beautiful focal point of any room. 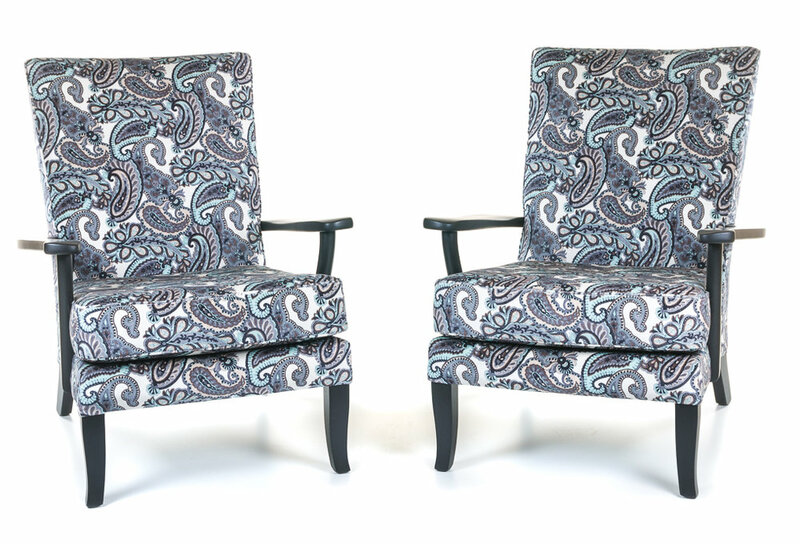 Pair of restored 1930's arm chairs upholstered in Arthur Sanderson Kandinsky velvet. This classic 70's Milo Baughman sofa has been restored and upholstered in Bute Storr material for Interior Designer Gilly Henson. 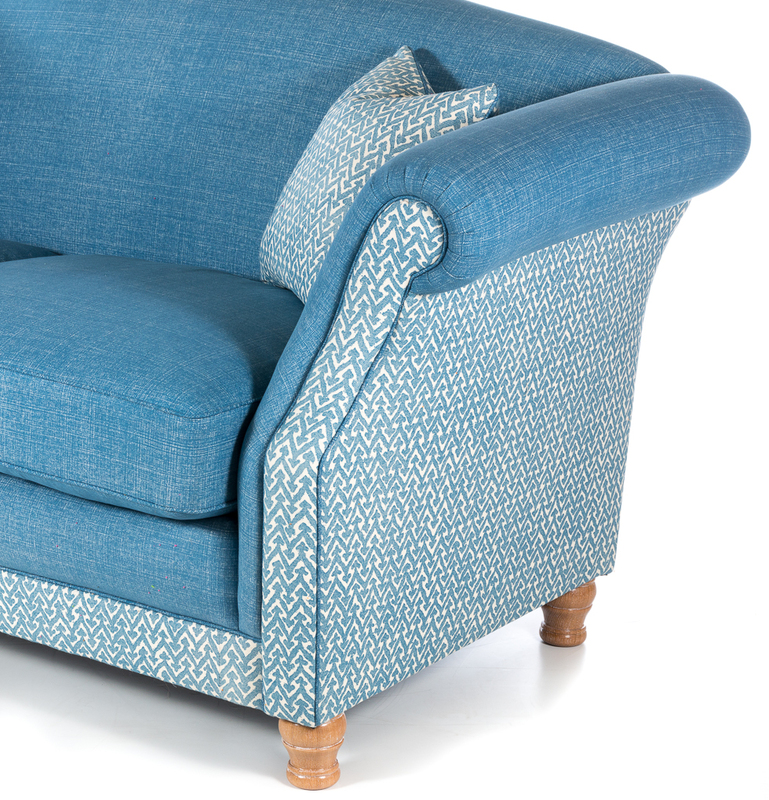 Corner sofas can be handmade bespoke to your own sizing and requirements, our experts are here to help you throughout the whole process from design to fabric choice. 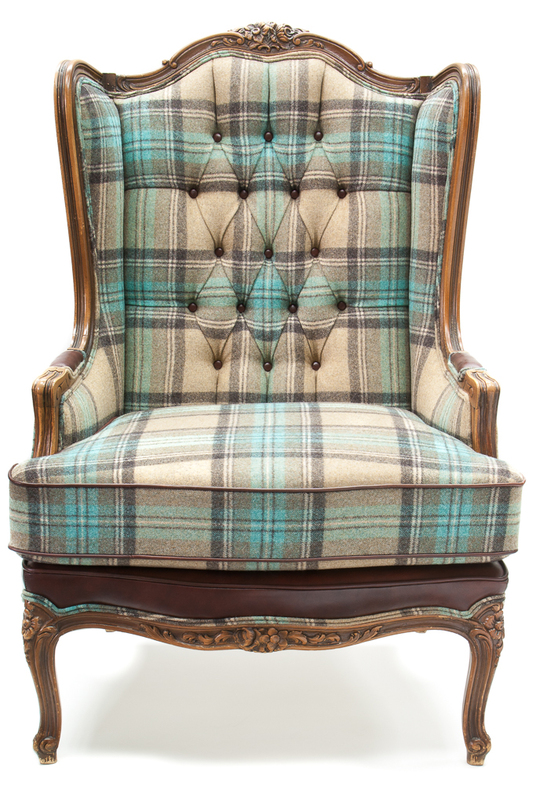 Georgian wing chair in Moon fabrics Benningborough Willow with fitted arm caps and head cover with a sumptuous feather cushion. 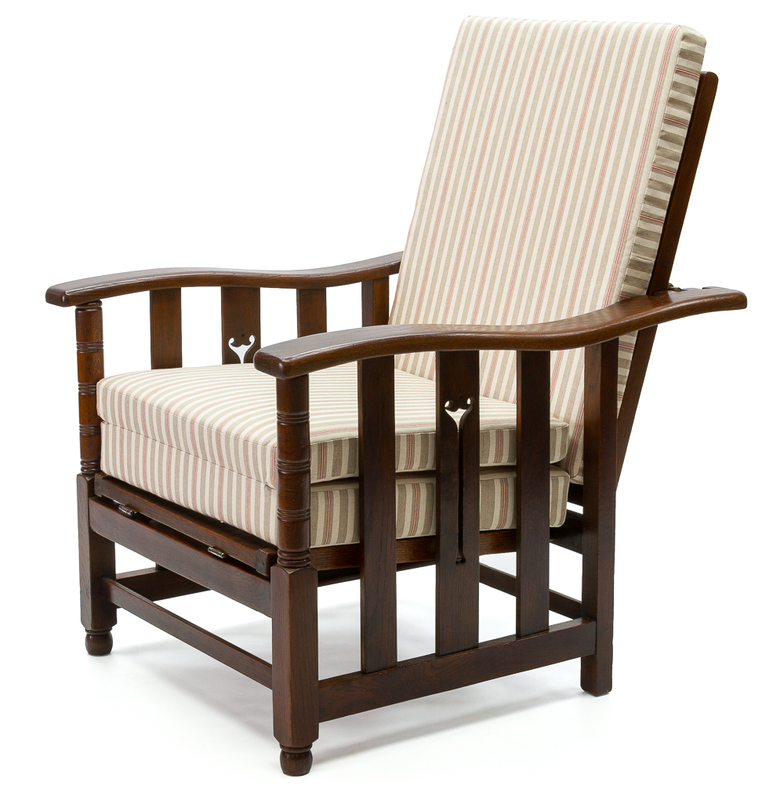 A restored 1920's antique Steamer Chair with a long folding cushion using an Ian Mankin striped ticking. 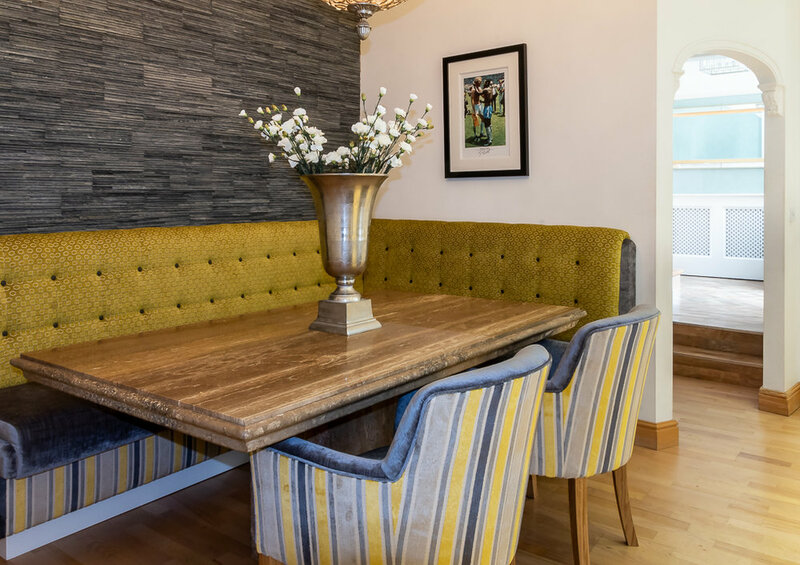 Whether you have a traditional or modern piece of furniture, at Crowther & Sons we have the expertise to carry out any job to the highest standard. High quality Footstools and scatter cushions Made to order with your own dimensions and requirements to add a touch of glamour to any lounge.